The Mykali Hotel sits on a verdant hillside overlooking the sapphire blue Aegean Sea in the beautiful village of Pythagorion on the island paradise of Samos. 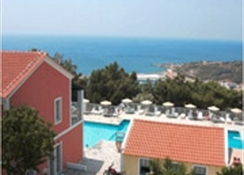 Just 500m from the beach and 1.5 km from the centre of the village, this friendly hotel is close to all local amenities, bars and restaurants and features 60 comfortable guest rooms with stunning sea views spread over 2 buildings and equipped with modern amenities. Guests to the Mykali Hotel can discover marvellous beaches and fishing villages and relax is in one of the largest swimming pools on the Island! 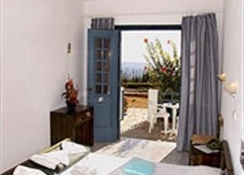 For an outstanding getaway in sunny Samos, the Mykali Hotel is a place where lovely memories can be made! The Airport is 3.5 km from the hotel. Local Tips: The hotel is located only 500 meters from the beach, with a superb sea view, offering a regular shuttle service to Pythagorio and to Potokaki beach. The facilities at the Mykali Hotel offer everything you need for a relaxing holiday. 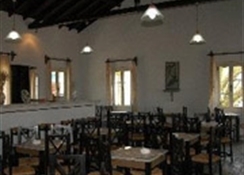 Food, drink and entertainment: The hotel has a restaurant, bar, snack bar and comfortable lounge. Sports, games and activities: Large swimming pool with outstanding views of the sea, sun terrace with sun beds and parasols, playground, Jacuzzi, tennis court, Satellite television and video room. Additional: Reception, currency exchange, safe deposit box (with charge), Internet facility, parking.